This quote attracts me for two reasons. Firstly, I recently met a young mathematician interested in meeting others with similar academic interests. When I suggested he might want to join a learned society he told me “oh no, the learned societies are just for old people and I don’t want to be part of anything like that.” I consider this a tragic statement. Without being so specific as to identify him, I will say this person was a dynamic, enthusiastic person and precisely the sort of “individual” able to make things “happen”. It is a real shame he didn’t feel the natural step was to align himself with an established “institution” to ensure the fruits of his enthusiasm “survive”. I do not know how widespread this viewpoint is but I have had others tell me that membership bodies (in general) are going out of fashion. This is sad: in and of itself, that an organisation which does good might not survive; that the enthusiasm of individuals may not be carried forward and amplified by affiliation with an organisation; and, in the case of the IMA, that membership of a professional organisation might decline at a time when individual professional development is increasingly well valued by employers. The second reason this quote spoke to me is I have met some extraordinary young mathematicians and mathematics students in my time as ULO. The students with the drive to set up or revive a university student mathematics society at the same time as completing their studies are always pleasing to meet. I have rarely seen an organised collective effort to set up such societies; rather such societies owe a debt to the work of enthusiastic individuals. There is a piece in the Student Section from one such person, Mike Ross of Heriot-Watt University, with his tips for others thinking of setting up a university mathematical society. Of course, the nature of student life means the enthusiast who set up the society will move on very quickly. Usually first year students are not sufficiently well established to set up or run a society until later in the year and final year students have other issues about which to worry (there are exceptions). I know several individuals who have been the driving force behind student societies who are moving on this year. The problem becomes: how do they ensure the continuity of their work? The successful model is usually to find a group of younger students who are willing to form an organising committee and take this on – forming a persistent “institution”. Sometimes this works and sometimes the enthusiasm decreases in the following year. A model I have seen work well is to involve a postgraduate student or member of staff in the organisation of the society. As they are generally better established and around for longer they can usually provide continuity and drive that a one year student committee might otherwise lack. Societies who manage this transition well can enjoy years of activities that are to the benefit of the students and the whole department. Such societies often include an element of peer support and community spirit which can help a department with issues such as retention. Departments that act to ensure a healthy society able to capture and build on the enthusiasm of individuals are to be commended. The post-Easter period is an interesting one. A majority of universities have finished or are finishing teaching and the appetite for a careers talk was reduced. However, the student societies are looking for fun activities to take a break from revision for exams. I gave my talk on spin in ball games followed by playing on the Wii at the Universities of Newcastle and Sheffield. An exception to the semester-based system is the University of York, who were at the start of the third term. 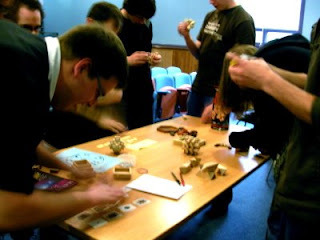 I went to York and gave an evening lecture on puzzles to the Mathsoc and opened the Maths Careers Fair with my careers talk and ran a stall (pictured are students “having a go” after my talk). The attendance for the careers talk was so great people were sitting in the aisle and others had to be turned away so I gave a second sitting of my talk for those students. I received positive feedback on my talk from staff and students. Other stallholders at the Careers Fair told me the students came out of my talk with enthusiasm and with a real pragmatism about what they needed to do, qualities the stallholders felt they didn’t usually see in undergraduates. The maths-specific careers fair format is a valuable one that I think works much more effectively for mathematics students than an untargeted fair. I attended and spoke on my activities at the 10th IMA Younger Mathematicians Conference in Oxford which was, as usual, a useful and enjoyable occasion. I spoke at an event on new technologies for maths promotion to the Maths Promoters Network. I gave an introduction to the day and spoke about use of social networking (mostly Twitter) and gave a podcast live recording demo with Matt Parker (which can be heard in episode 31 via www.travelsinamathematicalworld.co.uk). I was joined to speak on social networking (Facebook) by Noel-Ann Bradshaw of the University of Greenwich and on podcasting by Marianne Freiberger of Plus. Also speaking were Zia Rahman of more maths grads and Richard Browne of MEI who both spoke on online videos and DVDs. I made a visit to Kingston University to meet careers staff and postgraduates and attended the NUMS EGM at University College London. I ran a stall at a postgraduate conference at the University of Surrey. The University is in Guildford where Alan Turing lived as a child and he is honoured by a bronze statue outside the Austin Pearce Building where the conference took place (pictured). I had my 6-monthly meeting with my steering group in May and am happy to report this went well. There is a guide on university aimed at potential university students by the Independent. This includes an A-Z on careers and the mathematics article has just been released. Apart from the picture (a calculator; a non-scientific one), the article seems quite good. Essentially, maths is a difficult but worth it and has a good range of post-degree options. I am featured in a case study in the article. Noel-Ann Bradshaw, who contributes the Maths History features to the Travels in a Mathematical World podcast, and Steven Hughes, who will be organising the IMA Younger Mathematicians Conferences in 2010, both of the University of Greenwich, are featured as well. View the article “Getting Into University > A-Z Degrees > Mathematics” by Emma Bartley on the Independent website. I attended the 9th IMA Younger Mathematicians Conference last week in London. The Younger Mathematicians Conferences attract Mathematicians under 35 (and a few over to be honest – passports aren’t checked at the door!) from around the UK who are studying and working in Universities, Schools and in many sectors of Industry. This time the Conference heard from mathematicians working in Mathematical Finance and topics such as the maths of Google, the restoration of the Cutty Sark and much more. And it was a great opportunity for mathematics students and early career mathematicians to get together and meet others in similar situations. I have met several undergraduates at Younger Mathematicians Conferences in 2008. The 2009 Younger Mathematicians Conferences will be on Saturday 16th May 2009 in Oxford and Saturday 14th November 2009 in Birmingham. More information on the IMA Student webpage. As I have been on leave over much of the rainy summer, I wrote a shorter than usual report for Mathematics Today October. I am happy to report the IMA Younger Members Committee has taken enthusiastically to the Facebook group and has set up groups on other social networking sites LinkedIn and MySpace. Those of you who are on one of those online communities can join the IMA group and get involved. You should be able to find the group by searching “Institute of Mathematics and its Applications UK”. For other online activities, October will see the launch of a new podcast, Travels in a Mathematical World. This will feature a series of pieces from people I have met on my travels as ULO. Interesting mathematicians talk about their careers and interesting work they have done. There will be travels in time as well as space with a monthly maths history feature from Noel-Ann Bradshaw of the University of Greenwich and the British Society for the History of Mathematics. Finally we will round off each month with a maths news roundup from Sarah Shepherd, editor of iSquared magazine (incidentally, look out for the IMA adverts on the back covers of upcoming issues of iSquared). You can subscribe to the podcast by visiting www.travelsinamathematicalworld.co.uk. This is a brief report as I have been taking my annual leave during August while the universities are on their rainy summer break. I have been making the most of my time away however with an email going to heads of mathematics departments nationwide. This suggests activities where I can work with universities and I have had contact from several new student mathematics societies as a result. If you are in touch with such a group please ask them to email me at peter.rowlett@ima.org.uk and we can see how we can work together. I have also sent a survey to the IMA University Representatives. These are staff in universities who deal with the graduate recruitment exercise, receive copies of Mathematics Today for student and staff common rooms and administer IMA Prizes. I am collecting views on the graduate activities so we can try to have our best shot at recruitment at the end of the academic year. If you have any such views please contact me on peter.rowlett@ima.org.uk. The following report is my report in Mathematics Today August. The thought may or may not be welcome during the summer break, but the new intake of undergraduates will arrive shortly and my thoughts turn to engaging them with the IMA. A number of universities send out information to incoming students after A-Level results but before they arrive at university. I have received offers from some of the universities I have visited to include a letter from me in that mailing. This letter will encourage students to participate in mathematical activities outside of their studies through that university (departmental events and undergraduate societies) and more widely through the IMA (Branches, Younger Mathematicians Conference and the overarching “Mathematics” conference). Of course, this will also promote student membership and resources such as the MathsCareers website. Student members get access to the benefits of IMA membership at the much reduced rate of £10. I believe it could be useful to a university to have an undergraduate body with a good number of student members. Such a university will have a proportion of the undergraduate population receiving Mathematics Today and the eBulletin, and invitations to Branch events and IMA conferences. Such students are also demonstrating an inclination towards keeping in touch with the mathematics community and to their professional development as mathematicians beyond their studies. Such an arrangement would hopefully encourage a strong mathematical culture amongst the undergraduate body (more of which in the Student Section) and be beneficial for graduates. If you are willing to distribute this letter to your students please get in touch (peter.rowlett@ima.org.uk) and I will arrange to send you some copies. In May I went to the University of Manchester for the Manchester Research Students Conference, a conference for research students with the interesting idea that talks are used to learn about an area of mathematics outside your own research. I also visited Cardiff for the Eighth Younger Mathematicians Conference; a popular event which I believe was enjoyed by all. In June I attended the launch of the new West of England Branch at Kingswood School in Bath. This was a talk by Chris Budd on the theme of his article in the popular Industrial Mathematics special issue of Mathematics Today (February 2008) and was well attended. I spend some time at the University of Greenwich and I have just received a t-shirt from the MathSoc there. A set were printed with a grant from the IMA which will give the MathSoc increased awareness and will be sold to fund a print run of the revived MathSoc newsletter, ‘Prime Times’ and a further print run of t-shirts. I visited the University of Oxford for the post-exams Maths Options Fair. This event was well attended and I handed students a sheet of information on the IMA and a copy of the article “Careers for Mathematicians” by Sue Briault from the student section of Mathematics Today June1. I attended a Maths, Stats and OR Network workshop on Graduate and Employability Skills, hosted by Dr. Stephen Hibberd at the Centre for Integrative Learning, University of Nottingham. This was an interesting and lively day and I met many enthusiastic workers in this area. June also brought the Presidential Address of Prof. David Abrahams at the Royal Society, and I would encourage you to look out for this as he tours around the Branches. I rounded off June at the European Consortium for Mathematics in Industry – ECMI 2008 Conference, where I attended the opening day and welcome reception. This period has also been a busy one for IMA meetings, and as well as reporting to Council and Executive Board I have attended meetings of several other committees. It is useful to get an overview of what the IMA does and to meet some of those who give so generously of their time to further the work of the Institute. I also had my six month steering and personnel reviews and I am happy to report these went well. A reminder that the IMA group on Facebook and the IMA Facebook App are linked to from the IMA Student page (not just for students!) 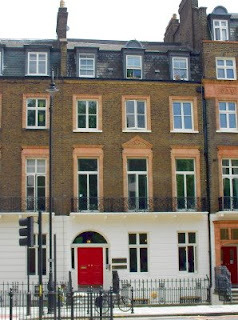 at www.ima.org.uk/student or search for “Institute of Mathematics and its Applications” on Facebook. In the Student Section this time is a piece by Shahzia Hussain of the Galois Group at the University of Manchester. Shahzia is an undergraduate with an impressive enthusiasm and energy for promoting mathematics. The Galois Group, her creation, is an impressive undertaking, especially on a voluntary basis alongside a mathematics degree and Shahzia is to be congratulated. This week saw the IMA Eighth Younger Mathematicians Conference at Cardiff University on Saturday. I took the opportunity to spend the week in Cardiff on holiday. Below are pictures of Cardiff Castle (near the University) and Cardiff Millennium Centre, which is fairly iconic. The weather in Cardiff was really nice all week, despite almost constant predictions of rain from the weather forecasters. The conference went well and was well attended. A group from the Oxford Invariants used part of a grant from the IMA to travel to Cardiff for the conference, which is nice to see. I used the opportunity to put a couple of questions to the younger mathematicians present regarding their awareness and impression of the IMA how they value membership. The results have gone back to IMA HQ to be compiled but I am looking forward to reading them myself.